This is plate 1 from William Hodges' book 'Select Views of India'. 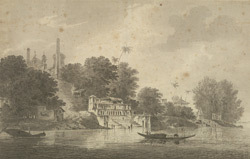 Hodges visited the ancient city of Ayodhya, then known as "Oudh", at the end of 1783. This view shows the Lakshmana Ghat on the banks of the Ghaghara river. The mosque at the top of the hill is the Babri Masjid, constructed by Babur, the first Mughal king of India, who ruled between 1526 and 1530. The mosque was infamously destroyed by militant Hindus on 6 December 1992.